Considering the fact that they scored 0-21, and have a success rate above average, it may come as a surprise to see a weighting below zero. This is due to the type of shot missed. Mayo had 11 attempts from play at a score from Sector8 yet only converted five. Of those six misses five came in the second half and was an indication of the malaise that set into the game post half time. 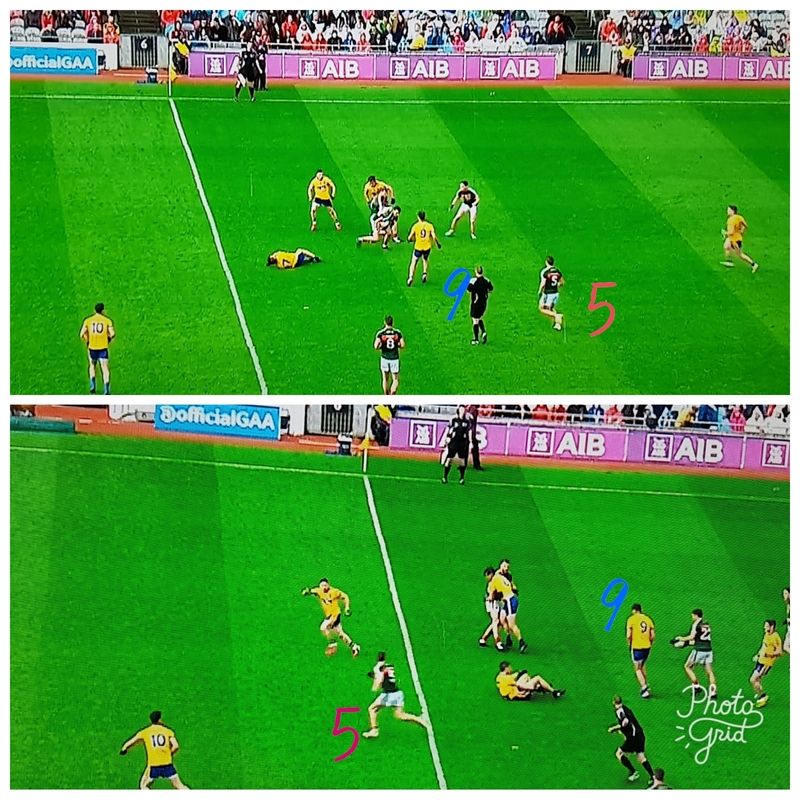 The above table shows the difference in Mayo’s shooting from play from one half to the next. Mayo were razor sharp in the first half when the game was “live”. Once the contest had abated their accuracy wained. 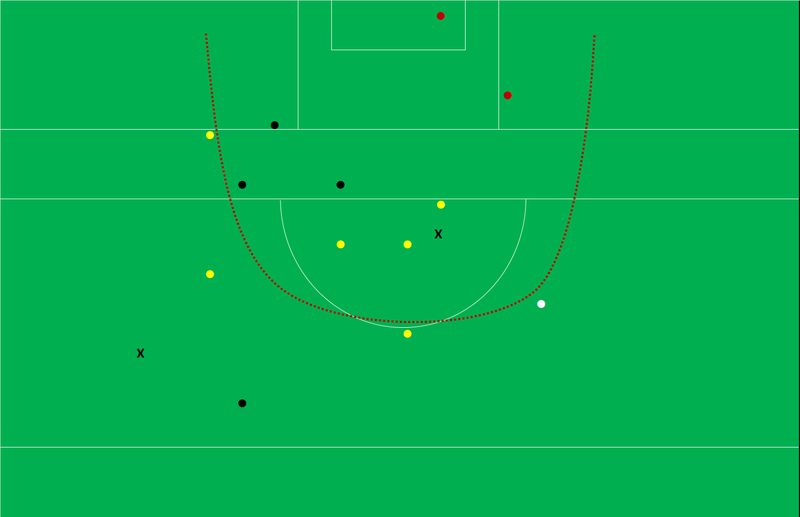 Overall Mayo’s shooting from play was average but Roscommon’s was abysmal. Yes it could be said they took on shots in the second half, through sheer frustration, that they wouldn’t normally attempt had the game been close but in the first half they only hit 33% (3/9). One notable feature of the game was the difference in the pressure being applied to the forward as they were in the act of shooting. Whilst the game should have had some intensity in the first half Mayo got 63% (7 of 11 shots) of their shots off without any pressure. 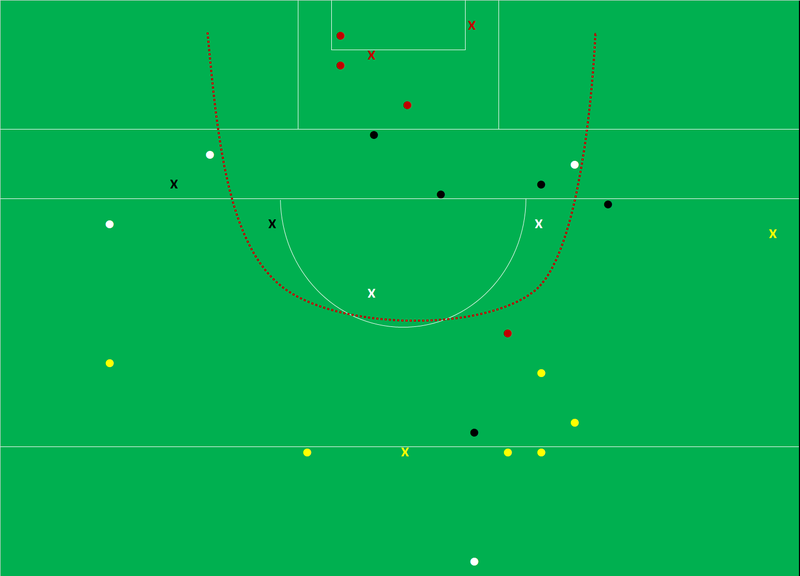 On the flipside they applied pressure to 100% (9 from 9) of Roscommon’s first half shots. In Cillian O’Connor’s absence Kevin McLoughlin carried over his league form. In the 5 Mayo league games charted he hit 90% (5/6) – again in this game he hit 100%. None of the frees he is asked to take would be deemed difficult – the longer ones were left to the two goalies and Freeman – but what else can you ask of what is essentially your back up free taker other than consistency? 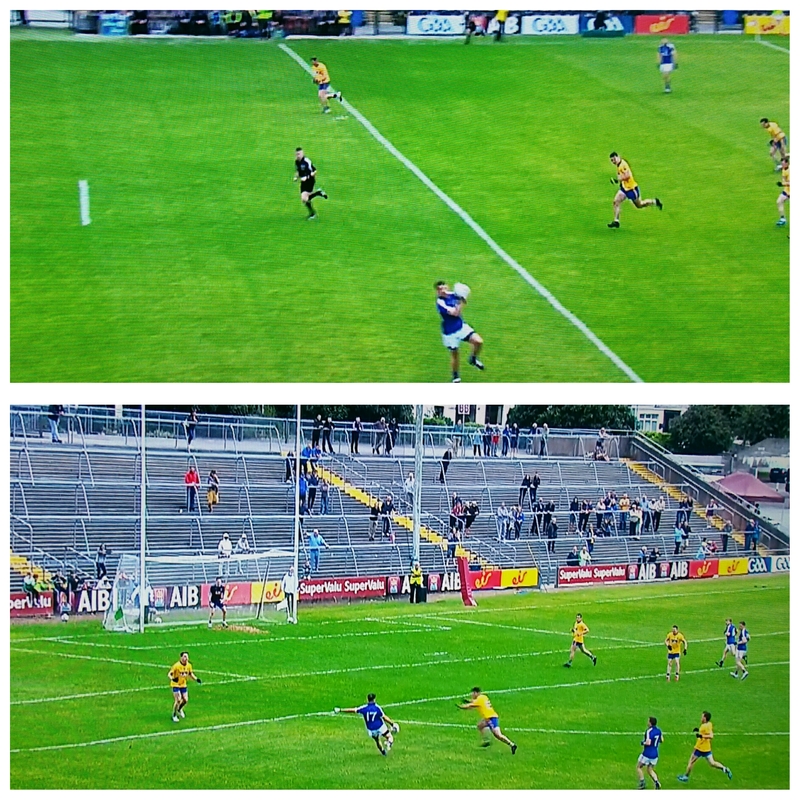 I am unsure as to why Mayo asked the two goalies to take the long frees. McLoughlin showed he has good leg strength with the one from c38m. 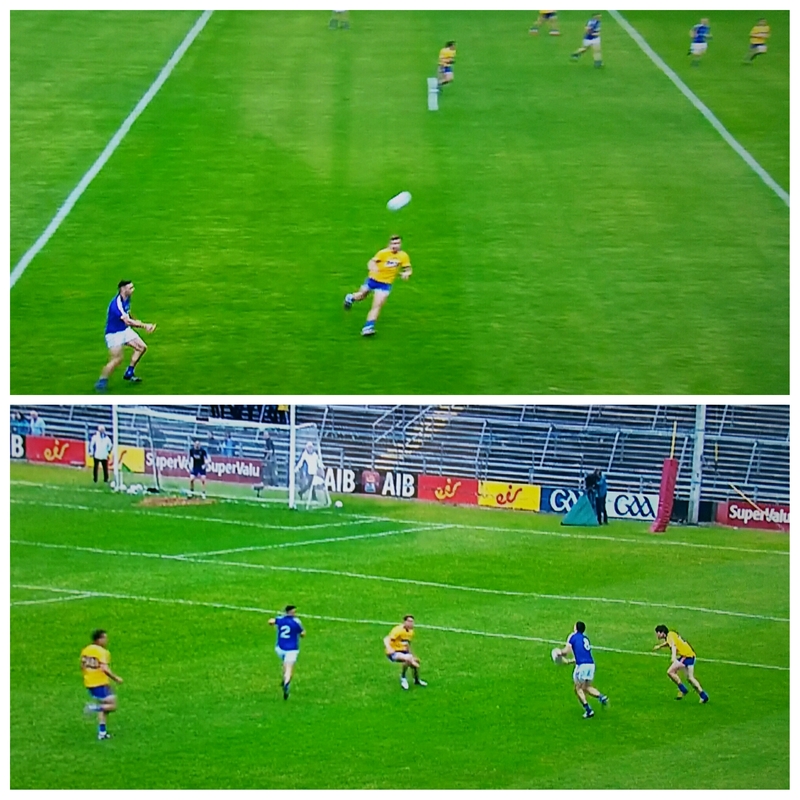 I’m not sure if it was just randomness or the fact that Mayo’s two best winners of primary possession up front, Freeman & Moran, were steering their runs out to the right, but there was a marked difference in where Mayo shot from when comparing the two halves. Almost everything from play came from the right in the second half. This can be seen in the Mayo shot chart with 2nd half shots from play in black and 1st half in white. Roscommon did quite well in the kickout department. I am sure pre game they would have been glad to hold Mayo to 55% given the presence of the O’Shea brothers. 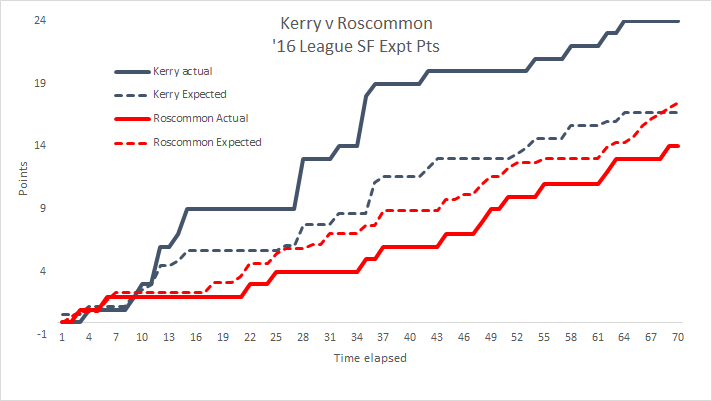 When they went past the 45m line with their kickouts they converted 83% (5/6) of those they won into shots however they also gave Roscommon 4 shots from the 7 they won. A shot differential of +1. So do you go long and get more shots but risk the opposition also getting shots? Or go short and convert less of that possession to shots but don’t give the opposition much in the way of shooting opportunities? In the last Mayo game (Vs Galway) the one player I called out was Alan Dillon. At that stage he had hit 11 from 12 shots in his last 4 Mayo games charted. And of course he goes and throws in a stinker. He wasn’t alone; I’m sure Cathal Shine would like some of those wayward attempts back. To the naked eye Joe Bergin appeared to lord over midfield once Finneran went off and the above table would support this. 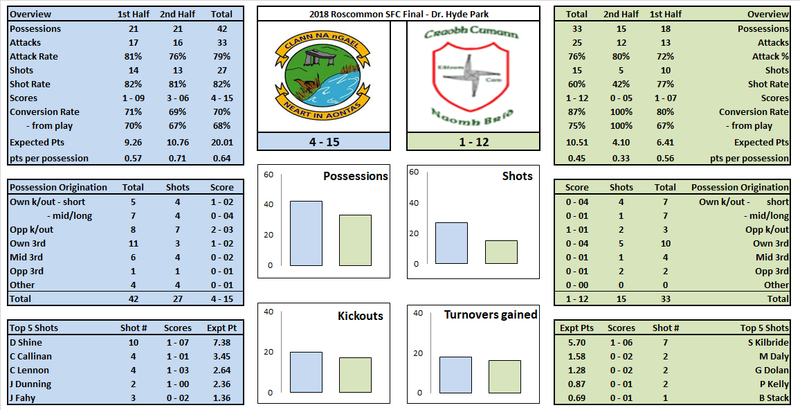 Roscommon’s shot & success rate was almost bang on average but the number of possessions they had was relatively small – they were starved of ball inside Galway’s 45m line. Galway on the other hand used what ball they had excellently. In the 36 games charted in 2010 (that are currently being used to provide the averages in the tables) no team had greater than a 77% shot rate – we might not see another team hit 80% again this year. When you see an outlier like this something exceptional has happened. A lot of people will recognise the outlier as Galway’s direct style of play and quality of foot passing into the forward line. Yes this will be part of the equation however how many times, from here on in, will they meet a defence as compliant as Roscommon’s? Galway have good forwards however if that shot rate drops due to (a) teams screening in front of Conroy or (b) stopping the likes of Bradshaw & O’Donnell attacking will the 56% accuracy hold up? Again Galway were good from play but maybe not as good as thought – compare their return (+2.22) with that of Donegal’s on the same day (+3.32). Both had low to mid 50s success rate – it was just that Donegal converted more of the difficult scores. 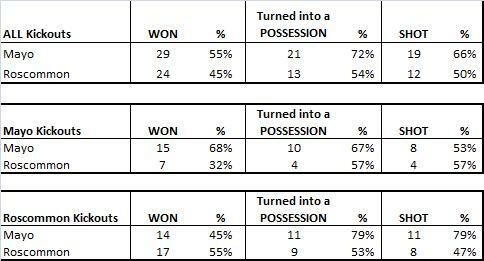 Galway can only beat what is put in front of them so the arguement can be made that they didn’t need to take on the difficult shots – if that is the case then a 52% success rate was pretty poor. Galway were good on Sunday; just not excellent. Conroy showed very well and produced the goods – both success rate and expected returns were above average. He was ably supported by a cast of Bradshaw, Bergin & Sice. Cummins only came on in the 63rd minute – we’ll put that showing down to over exuberance! I was on the verge of writing a seperate post altogether on Donie Shine as I’m not sure I’ll do it justice here – I don’t mean to be over critical but it is what it is. Shine had 9 shots in total on the day scoring with two of them. It was a poor outing with a combined (deadball & play) expected return of -3.30. We have however seen this before. Below are Shine’s results for the 4 games charted (3 in 2010 & this game). On 3 of the 4 occassions he returned a negative expected return and in all games his deadball striking has been below average. The deadball returns go against the perception of Shine as an excellent free taker. I would argue that he is a taker of excellent frees rather than an excellent free taker – we remember the booming kicks he hits to win games but forget the two 45s he misses in the same game. The arguement can (will) be made that Shine is the only quality forward Roscommon has. He knows this and thus takes the responsibility on his shoulders to shoot on sight or take the difficult shots.This might also explain his poor return from play. It is an arguement that has some validity however this is where the expected return comes into play – he is below average in converting those shots he does take on. Whether they are easy or hard he’s simply not converting enough.